Prosecutors said the two men had turned the warehouse into a residential "death trap"
A California judge on Friday rejected the plea deals of two men who were charged with 36 counts of involuntary manslaughter after a 2016 California warehouse fire. Roz Plater reports. A California judge on Friday rejected the plea deals of two men who were charged with 36 counts of involuntary manslaughter after a 2016 California warehouse fire. 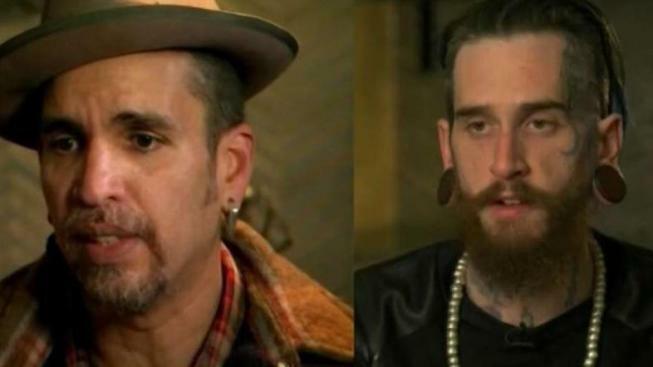 In handing down his decision, Judge James Cramer said 48-year-old Derick Almena didn't accept "full responsibility and remorse" for the fatal blaze which occurred during an unlicensed concert at the dilapidated Oakland warehouse known as the "Ghost Ship." The plea deal had called for Almena to be sentenced to nine years in prison and 28-year-old Max Harris to six years. Relatives of victims who died in the blaze had slammed the proposed sentences as too lenient. Authorities have alleged Almena rented the warehouse and illegally converted it into an entertainment venue and residences before the fire. Harris was accused of helping him collect rent and schedule concerts. Prosecutors said the two men had turned the warehouse into a residential "death trap" by cluttering it with highly flammable knick-knacks, blocking the building's few exits and failing to make adequate safety precautions before inviting the public inside. Almena's attorney, Tony Serra, told reporters after Friday's hearing that he will take the case to trial. Cyrus Hoda, the brother of victim Sarah Hoda, had called the plea bargain a "sweetheart deal" and labeled Almena and Harris as "culture vultures" trying to become San Francisco Bay Area arts players by luring people to a dangerous place to live and party. Almena's wife and three children also lived in the warehouse but were staying in a nearby hotel the night of the fire. His wife, Micah Allison, and one of their daughters sat quietly in court alongside the grieving families. Dressed in jail garb on Thursday, Almena looked unemotionally at the relatives as they testified, while Harris stared at the judge, who approved the plea deal last month. Cramer told relatives of victims to try to keep their emotions in check during the testimony, which he said would be "a heart-wrenching hearing as befits the enormous loss in this case." Almena and Harris could have faced life in prison if convicted at a trial. They already have spent a year behind bars. Investigators from the U.S. Bureau of Alcohol, Tobacco, Firearms and Explosives said they were unable to determine a cause of the blaze. Victims' relatives allege in lawsuits that the Oakland Fire Department failed to inspect the warehouse annually as required and that inspectors would have discovered the illegal conversions. Alex Katz, a spokesman for the city attorney, declined to comment. The lawsuits also claim Pacific Gas & Electric Co. failed to properly monitor, inspect and repair electrical equipment that provided power to the warehouse. PG&E said in a statement that it cooperated with the investigation and that a review of its records found no electrical problems at the building in the 10 years before the fire. Warehouse owner Chor Ng, who has not been charged, did not return a phone message seeking comment on Thursday.